Willem Mulderij has achieved what many pigeon fanatics dream of. He recently obtained the number 10 position in the interim score of the Dutch Fondspiegel total ranking over 2007, 2008 and 2009. This ranking is based on the scores of the 3 marathon flights St. Vincent, Montauban and Bergerac. All points of all pigeons are added up, which is then used to calculate the average points per pigeon. The national ranking of (the past) 3 years is subsequently determined by adding up the (average) points of the last 3 years. This year Willem Mulderij was ranked 2nd in category 5. 73% price (22 out of 30) with an average score of 481 points per pigeon! 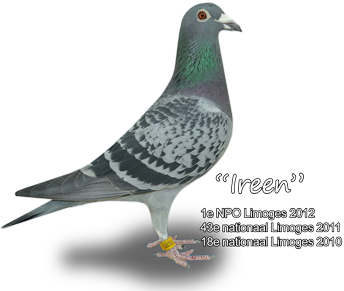 A true supporter and practitionar of the pigeon sport with not much time, strong pigeons, a simple system and a breeding shed that is composed of straight Jan Theelen, Theo Ernest, Herman Brinkman and Nico Volkens pigeons.